Don’t worry about clogging up cyberspace. Google made sure it’s huge so they can keep track of every minute of your life. Didn’t you feel them looking over your shoulder as you took those sunset photos? Every second there’s a zillion new entries launched into cyberspace. Totally incredible. Thanks, Candice. I appreciate that. We seem to pass through a cynical period in our lives when we readily dismiss what I might call the simple pleasures this world presents to us and express a “seen it all before” attitude with unfortunate regularity, almost as a badge of being experienced/grown up/ travelled/educated etc. Thankfully, like other phases of life, it passes and we come again to enjoy … sunsets, sunrises, natural beauty, a walk on the strand, a stroll in the woods, wildflowers – my special favourite in latter years. Should we tire of these beautiful things – sunsets and the likes – we really have become tired people. Becoming old is unavoidable but becoming tired of life doesn’t have to to be! Hi Paddy. I couldn’t agree more. It’s “the little things” that mean a lot. I have a friend who regularly tells me of, as she puts it, “las pequeñas cosas de la vida” – the little things of life”, those small things which brighten up the day – a new plant for the garden, her child’s smile, a sunrise! etc. These are the condiments of life! Hi there. Many thanks for stopping by. I’m glad you enjoyed this piece. Have a great rest of the week. I always enjoy a good sunset. And this one you’ve delivered is one of the best. Keep clogging! Good to hear from you, Carmel. I was lucky to be in the right place at the right time. Sometimes you really luck out. I know. It was great. I was lucky to be there. Hey there. Sunrise is excellent too, except that you have to get up too damn early to see it! Hi Ruth. Sunsets are amazing. Each is different. Each is beautiful in its own way. And they take place every day! Absolutely perfect 6:07 photo. Aren’t you glad you looked back?! I love, LOVE sunsets. The ones in the deserts of Arizona are particularly fantastic as are the sunsets in the Rocky Mountains. Every single night for four months while caring for my mother in Carefree Arizona, I’d drop everything to spend time on her rooftop to catch the sunset. There was a sitting area up there and most evenings the Arizona sky did not disappoint. It softened considerably the difficult nature of my visit there. 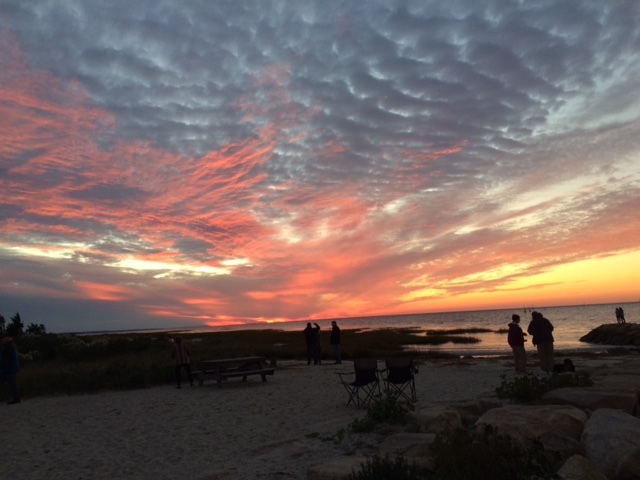 BTW…I’d say you LOVE Cape Cod. :-). Have a marvelous Monday. Morning, Cristina. You’re a sunset junkie! I love the sunset photo at 6 07. You should print it and framed. Enjoy! Hi Joyce. 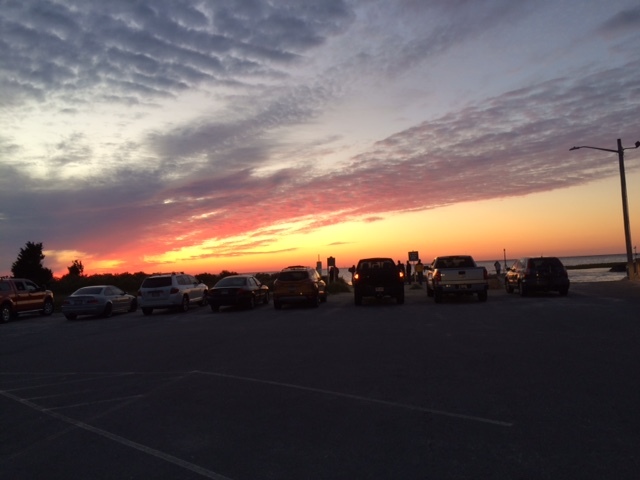 You might want to check out Rock Harbor on your next visit to the Cape. A gorgeous area. We’ve been going to Orleans every August for years. Would like to try October. Rock harbor, sunsets, beautiful. Thanks for sharing. Thanks for stopping by, Vincent. It’s always good to hear from you. One can never have too many descriptions of fantastic sunsets. Or too many photos. Those who tire of them are clearly tired of life. So true about clouds making for a more spectacular sunset. That 6:07 one is indeed a beauty. Morning, Laurie. Like I said in the story title, me and my wife won’t forget that sunset anytime soon. Have a great week. Be seeing you. Hey there. Clouds are the key to a sunset. They can expand sunsets all over the sky. For so many years I’ve wanted to visit Cape Cod and I still hope that one day I will. This post just makes me long to do so even more. Beautiful! Thanks a lot for visiting, Michael. Cape Cod is varied. I like most aspects of it. Nature-wise, the most astounding part is the Atlantic Ocean coastline, which I suppose is about 60 miles long. The 6:07 photo definitely comes our on top! Lucky you, spending time in “Old Cape Cod”! It certainly brings out the poet in you, doesn’t it? Morning, Diane. My wife and I visited Cape Cod for the first time in 1998. Unexpectedly, we got hooked. We keep coming back. That orange flame photo is beautiful. Looks almost like the Northern Lights. Hi Tyler. You can’t go wrong with sunrises or sunsets. Remarkable parts of the day. Great pics, Neil – I often find it’s difficult to capture the magic of a sunset with the standard sort of cameras (or cameraphones) we ordinary mortals have, but the combination of the shots and your words did the trick! Beautiful! I share your awe. It was a great way to spend half an hour. Enjoy the rest of the week, Anabel. Take care. Wonderful. That sky is jaw droppingly beautiful. Hi George. My wife and I definitely lucked out. What a show! Sometimes you just have to be patient with a sunset! Our house faces south so it’s the sunrises that are magical. Hey there, JT. Sunrises have an optimistic aspect to them, because they usher in daylight. Man, I hope The Kinks get back together. One of my all time favorite bands. My gal loves a good sunset. We are fortunate to get some beauties where we are. Keep enjoying the good stuff Neil. It keeps me on track. CB, I’m looking out for you! What a beautiful place and such beautiful sunsets – Will definitely have to visit some day. Hi Alyson. I’m pretty certain that you’d love this area. It’s got a lot going for it. I agree with you about the clouds. They can blanket the sky in ‘meh’ … like we have today … or create a breathtaking vista … especially with the setting sun. Many thanks for stopping by, Joanne. Clouds really open up the possibilities when it comes to sunsets. And sunrises too! Spectacular, I would imagine. And so get to take the time to stop and smell the sunset! Hello there. I consider myself very fortunate when I’m on Cape Cod. There’s a lot of natural beauty here. The problem with sunrises is that you have to get up too early to see them! Hi Isabelle. Thanks, as always, for adding your thoughts. Much appreciated. Yeah! You’re so right. Being a late riser in the morning, sunrise is far too hard for me to enjoy. Always great to have a chat with you Neil. Thank you, too. Beautiful! My family makes fun of me for taking so many sunset pictures. Let them laugh. I don’t care. They can be so varied. I suppose that that is one of the most amazing things about them. I agree, sunsets are beautiful ! You can never get enough of them ! In each image you see a different view , the sky keeps changing and the clouds give a unique satisfaction when looking at them ! Hi. Sunsets are fluid art. Thanks for adding your thoughts. I appreciate that. You are welcome!!! I love them too and i’m glad i can share this with all the sunset lovers!! Since there’s supposedly only seven basic stories or plots in the world anyway, how can anyone not repeat themes? I just looked them up: Overcoming the monster, rags to riches, the quest, voyage and return, rebirth, comedy, tragedy. Your sunset story probably falls under the quest. Maybe a feeling of rebirth, depending on the situation or level of emotions evoked, and your photos are certainly moving and humbling. Great to hear from you, Stacey. Do awe and appreciation fit into any of those categories.? Those are the feelings I usually get when I’m looking at a sunset. One can never write about sunsets too much, Neil. This one definitely deserved your exuberance. Hi. I’m not sure which song that is. But please don’t tell me, or else it probably will get stuck in my head too. Tanja, I knew I could count on you. I think as some of your pics demonstrate, it’s the clouds–their texture and “arrangement”–that really make a sunset a SUNSET. Glad you got to grab “one more” before packing up and heading back for WINTER (she sobs). Also, this line caught me: “more accurately, Sandy spent time in a clothing boutique that’s been a favorite of hers for years, while I sat on an old wooden bench outside the store waiting for Sandy to emerge.” LOL, that’s familiar. My husband Ed has spent his share of time on benches outside various shopperies. He always comes prepared with a good read and apps like Solitaire on his phone. Except for the holiday sale at Macy’s when he buys every shirt in the store in his size, while I stare for hours at a pair of nifty boots, reminding myself I already own more pairs of nifty boots than I have closet space for. Ed and I are patient and understanding people! I’m the last person to disparage nice sunset shots. I’m kinda partial to ’em, actually. More interesting than baby [kittens/puppies/grandkids/wild critters]. All of these are gorgeous but the second one is my favorite! I love a good sunset, as well. I’m very fortunate that I work at a restaurant on the 71st floor of the tallest building in L.A. and get to see miraculous sunsets each evening. It must be amazing to see sunsets from so high up. I’m kind of jealous! I don’t see why you can’t be a National Geographic photographer? We were actually in Cape Cod for a day trip this past summer but unfortunately my youngest was ill and we had to rush back to our hotel in Boston. We missed the sunset… next time. In the meantime, thanks for sharing. Hi Annika. Cape Cod awaits your return. If you visit again, take in the section of ocean coastline that runs from Eastham to Provincetown. It’s spectacular. Thanks Neil, we did drive all the way up to Provincetown up to tip where the road divides and turns back and it was truly magnificent, just no sunset. We fell in love with Boston so I’m sure we’ll be heading down again! That sunset really is pretty spectacular. I often see great sunrises on my way to work but I’m driving and can’t take a picture. Hi. Sunrises and sunsets are really something. Fabulous spectacles that take place every day. Thanks for dropping by my humble website. Take care. I gasped when I saw the fiery orange sunset images. Stunning! P.S. And there’s no such thing as writing too much about sunsets. Hi there. The orange flames were amazing. One second they weren’t there, and then all of a sudden they burst through. Be seeing you. Enjoy the upcoming weekend. Great post! We’ve had a rash of crazy-colorful sunrises this week in Missouri. Love your pictures! Thanks for stopping by, Marilyn. The skies have been putting on great shows. And the price is right (i.e. free). It is so nice to know you and Sandy are having a great time. Enjoy! Be spoiled! Thanks, AOC. It has been a real good trip. Wow! Gorgeous! 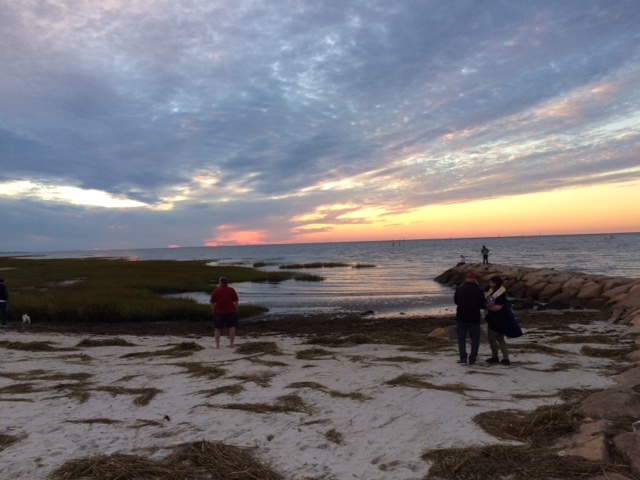 In September we went to Cape Cod for the very first time – we will be back! Hello there, Julie. 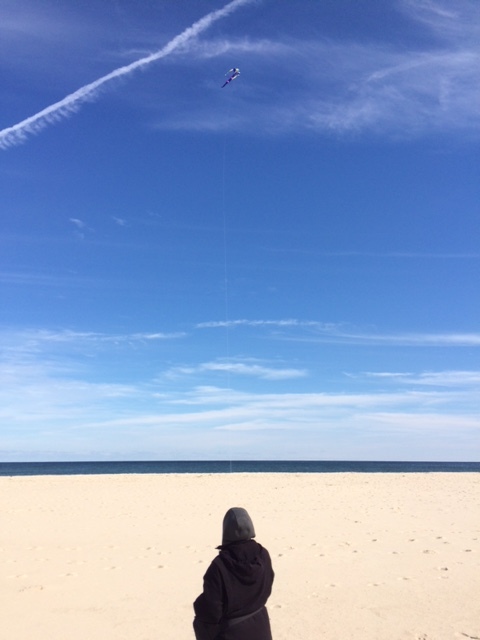 There is an expanse of huge sand dunes in Truro and Provincetown. Check them out next time, if you haven’t already seen them. It’s an aspect of Cape Cod that many people don’t know about. My next story will partially be about the dunes. You can write about sunsets of all kinds any time and every time so long as there are pics. There’s too much suffering in the world right now (sympathies, Neil); we need all the beauty we can get. Those are amazing captures! Sticking around was clearly worth it. The clouds were broken just enough to capture the color without blocking the sun completely. Perfect! My wife and I caught 3 sunsets while we were on Cape Cod recently. All were good, but this one was the best by far. See you, Jean. Just heard a character on a TV show mention casually, “Funny, how as we get older we forget the things that bring us joy.” Your recent posts have been reminders of things worth noting and treasuring– sunsets, coffee, companionship, good writing …. Hi Liz. Good to hear your thoughts. Right, enjoying the “simple” pleasures is a good way to live. The most intriguing thing about sunsets is the unique light show. They are never quite the same and often spectacular. Keep writing about them with the beautiful pictures. I don’t mind the clogging. Hi Kimberly. Sunsets (and sunrises) are feasts for the eyes! Hi Lieve. I’m with you on everything you said. Thanks a lot for stopping by. Much appreciated. I have never seen as beautiful a sunset as this because roofs and trees obstruct as well. I’d linger too if given the chance to see the sun set. I was lucky to have seen this sunset. It was a great one. Thanks for adding your thoughts, Imelda. I’m always glad to hear from you. Stunners indeed! You must do the sunrise/ sunset watching thing more often! Colorful sunrises and sunsets are wonders. And the shows are free! AOC, I wish the happiest of new years to you and yours!